June 13, 2016: WorldLoop, as part of a consortium led by the Italian take-back scheme Remedia, has been involved in the EU Horizon 2020 funded project – Developing an e-waste implementation toolkit to support the recycling and the secondary raw material recovery strategies in metropolitan areas in Africa (EWIT) since March of 2015. The project, now entering into its second and final year, held its final workshop last week in Antwerp. The Antwerp-Abidjan Workshop, the last in a series of 8 Twin-city workshops, was a follow-up to the meeting held in Abidjan last September. The outcome of that workshop was a master plan, a technical and strategic document to facilitate the holistic formulation of an operational Action Plan for Abidjan to address its unique E-waste management issue in a sustainable way. 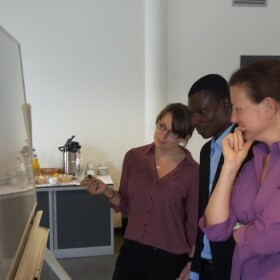 The Antwerp workshop brought together experts from the University of North Hampton, University of Abidjan, PARO-CI and the City of Antwerp to develop the Action Plan based on the outcomes of the September Abidjan meeting. WorldLoop, as expert lead on Circular Economic Closed Loop solutions, with its hands-on experience in developing countries participated in this meeting. It started with a pre-day visit to Antwerp’s kringloop, or second-hand, system to support sustainable material reuse in the municipality of Antwerp. The day ended with a visit to one of Antwerp’s Collection Sites where the process of larger household and construction waste collection is facilitated. While the two municipalities have little in common at first glance, synergies across the two presented themselves throughout the two days. The strong presence of a reuse market and association of waste collection in Abidjan also exists in Antwerp. While awareness on proper waste management and treatment is low in Abidjan, Antwerp has been running cleaner community campaigns and learned valuable lessons of what messaging works to drive public perception and perhaps also behaviour change of its inhabitants. Seemingly insignificant, these lessons can be beneficial for a municipality hoping to increase awareness when launching e-waste management initiative. The group further developed an action plan to protect the environment and public health, promote circular economy and strongly integrate all the actors of the value chain, from the collector to the repair shops to the municipality, businesses and homes. The entire EWIT project is entering into its final stages with the development of an online E-waste Implementation Toolkit and Knowledge Base compiled of data gathered throughout the last 1.5 years. Final dissemination is expected in the coming months.